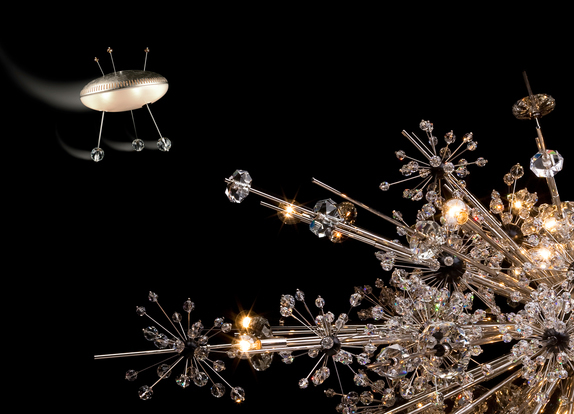 Lobmeyr 's famous chandeliers for the New York Met were inspired by distant galaxies at the height of the space age. The aesthetic universe of the time was heavily influenced by Hollywood B-Movies like The Flying Saucer . With the UFO series we evoke precisely this lost innocent vision of the future. Each 'flying object' has a special element that plays the lead. By differently arranging glass and brass, each chandelier has its own lighting properties. Lobmeyr is linked to space travel not only by its tradition of innovation. In orbit and in Vienna every piece is unique.